Need something to keep you busy this weekend? Look no further. The Weekend Workshop is our weekly column where we showcase a badass DIY project that you can complete with minimal skills and expertise. We’ve dug through all the online tutorials on the web, and gone the extra mile to pinpoint projects that are equal parts easy, affordable, and fun. So put on your work pants, grab your tool belt, and head to the garage. It’s time to start building! In Bethesda’s Fallout franchise, gamers assume the role of a vault-dwelling protagonist who’s forced to brave a post-apocalyptic wasteland in order to survive. Above ground, this protagonist forages for weapons, supplies, and just about anything they can get their hands on. Th currency in this scorched world looks a tad different than you might expect, though. Whereas pre-war money boasts no inherent value, bottle caps from the universe’s Nuka-Cola bottles reign supreme. Well, thanks to some savvy DIY work from an Instructables user known as Memorabeliac, anyone with a bit of red spray paint, access to a printer, and some sticky super glue can create their own lot of Nuka-Cola bottle caps in a few short hours. These won’t possess any real-world value, of course, but they do make for a rather funky addition to a budding video game memorabilia collection. With the necessary build list at the ready, it’s now time to start piecing together your very own collection of Nuka-Cola caps and companion jar. Simply follow Memorabeliac’s comprehensive walkthrough on Instructables and before long, you’ll be one step closer to surviving The Wasteland. Happy building! 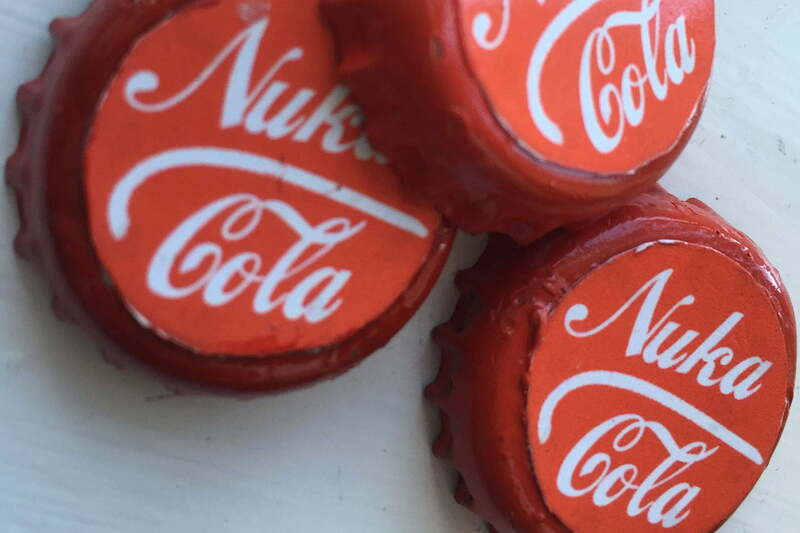 The complete walkthrough for building these DIY Nuka-Cola caps and jar can be found at Instructables.